Everyone loves Santa and luckily I was asked to make a Santa face for my friend’s daughter’s birthday. I made an 8” chocolate cake with cookies & cream filling. One of my favorites!! This cake is really quite simple to make. After leveling the cake ice the top only with buttercream icing. Using fondant tinted a flesh color cover the top. No need to cover the whole top. You really only need enough for the face. Refer to the picture. 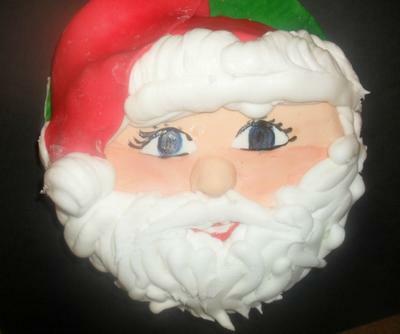 Make Santa’s nose out of a 3/4" ball of fondant. Using a ball fondant tool; make 2 indentations for Santa’s nostrils. Then place in the center of the cake. Using white fondant, cut out 2 pieces shaped like eyes. Now this part is one of my favorite things to do. Paint the eyes with gel food color. I love the look of painted cakes. It made the eyes pop out at you!! Carefully place the eyes on the cake. Then carefully outline and paint lashes. If you don’t want lashes, not a problem....don't paint any. You can make Santa's eyes any shape, color, or style you like. I love lashes, even if it might be a little girly for Santa. Very carefully dirty a paint brush with red color to make the rosy cheeks. Do not use much color for this! Next carefully ice the sides of the cake, being careful not to get icing on Santa's face. I prefer to do this step this way, because I do not want the icing to crust before I pipe the beard and hair. It will adhere better and you will have less chances of the beard and or hair of falling off the cake. Using a 2A tip, pipe the beard using white buttercream. You will want Santa's beard to start at his face and go down to the bottom of the cake. Do the same for the hair that outlines the face. I like to make it look like he has wavy hair. Pipe his mustache last so it doesn’t get lost in the beard. Next roll out red fondant and cover the top part of the cake. Cut out another piece of fondant like a triangle with a rounded point. Starting at the bottom of the cake, place the triangle with the rounded end ending to the side of Santa's face as pictured. This will be Santa's hat. Lastly pipe a large pompom for Santa's hat and white trim for the fur around hat. I've seen a lot of Santa face cakes, but this is by far the cutest!!! Love the eyes!! Adorable! !